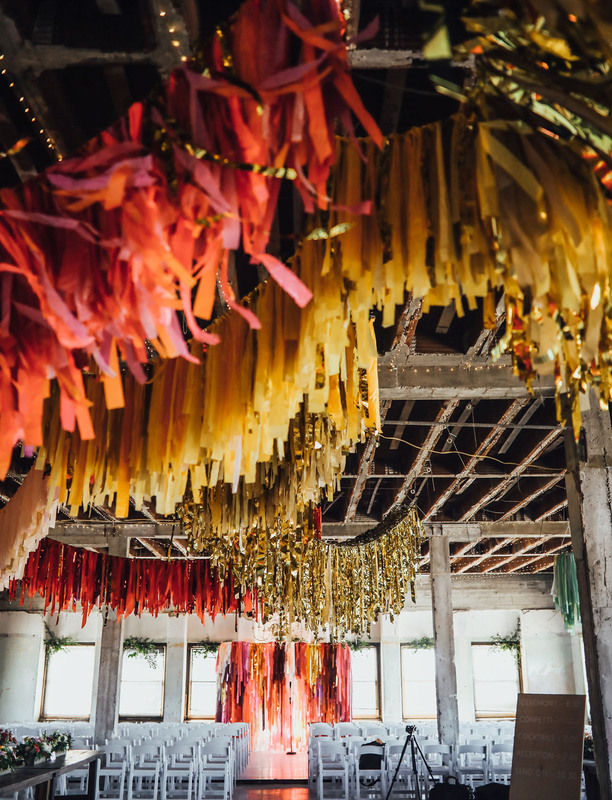 A Colorful Oklahoma City Wedding with Lots of Confetti! 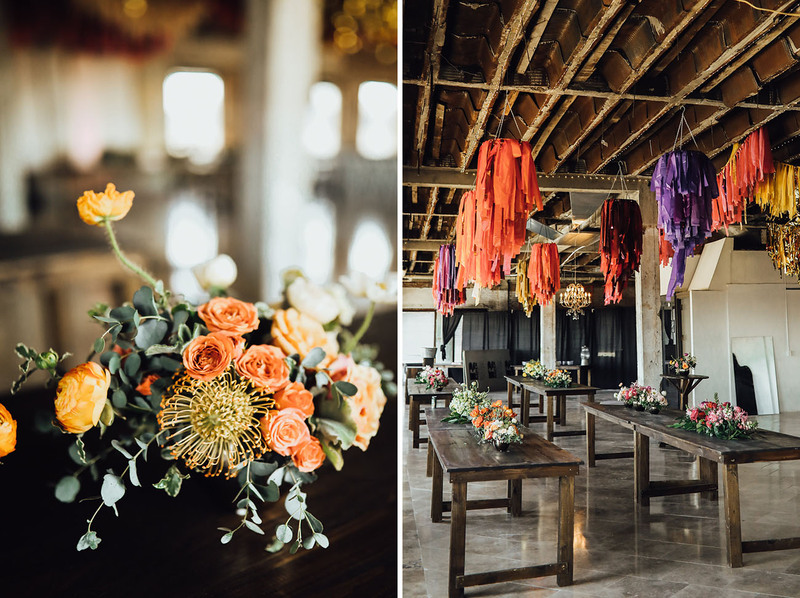 Hues reminiscent of the sunset lined the walls and colorful streamer chandeliers were festooned from the ceiling, the bridesmaids rocked every shade of orange, and everything felt modern and fresh, yet classic. 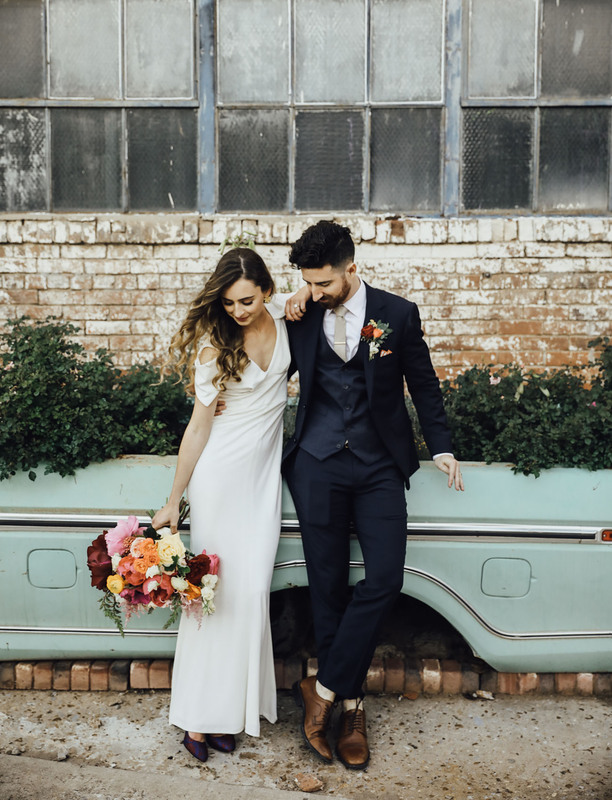 Photographer Rachel Waters describes Victoria and Caleb as: thoughtful, smart, eclectic, bold, fun, funny, welcoming, and really do make the world a better place. 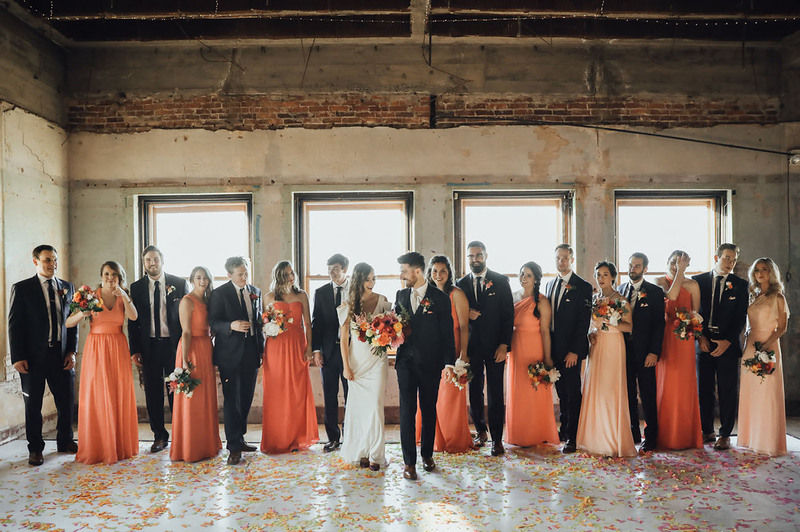 Upon meeting them, she fell head over heels for their cool + laid-back vibes, their love of Chance the Rapper, Harry Potter, and traveling. 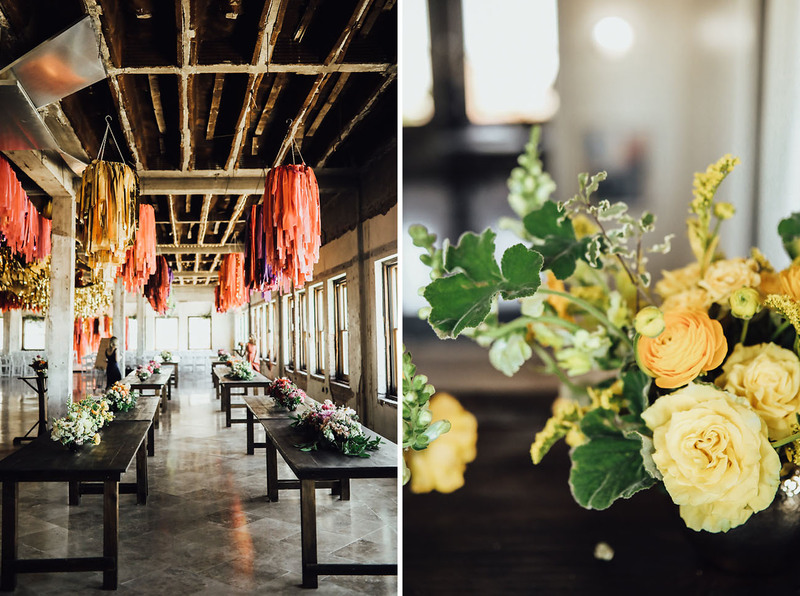 V+C wanted to bring all these elements to their wedding, along with modernism, color, and an abundance of rich florals, so they brought on Morgan Davis with Leslie Herring Events to bring their ideas to fruition. 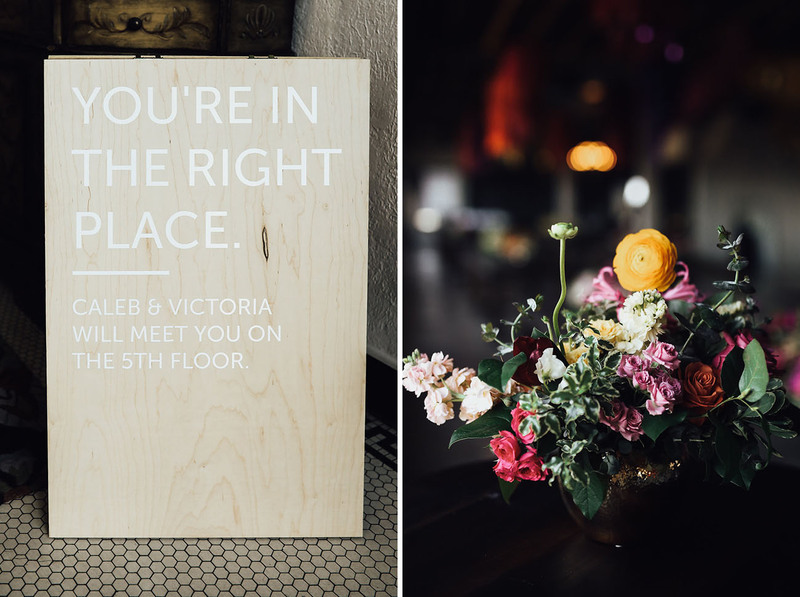 Victoria shares Our original inspiration for the day was a film photo. I wanted everything to feel golden and warm and like a memory in the making, the way you feel when you look at old pictures. 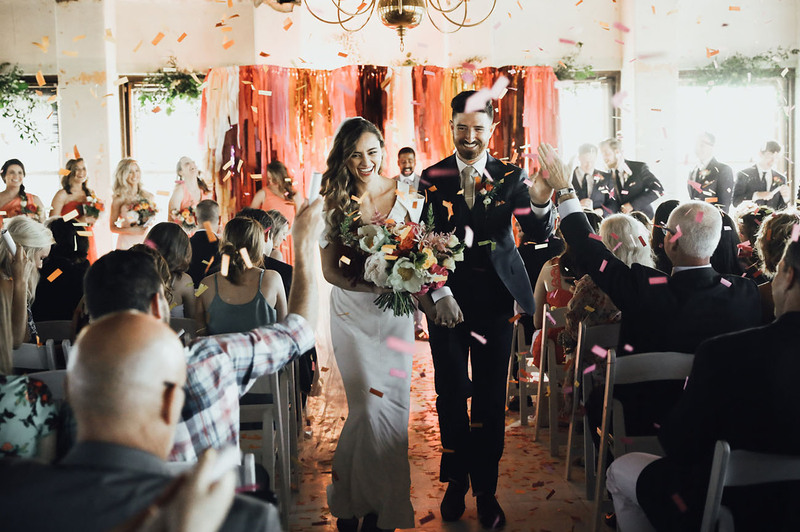 When we mixed those warm tones with a big toss of confetti, we came out with a fun, vibrant ceremony that felt more like a party. 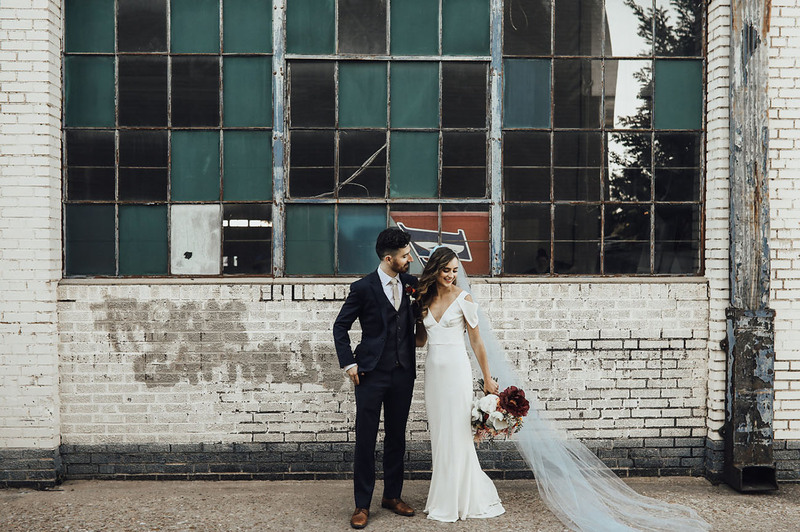 Ready to dive into the fun at The Magnolia Room in Oklahoma City and see all the warm memories captured by Rachel Photographs? Let’s go!! 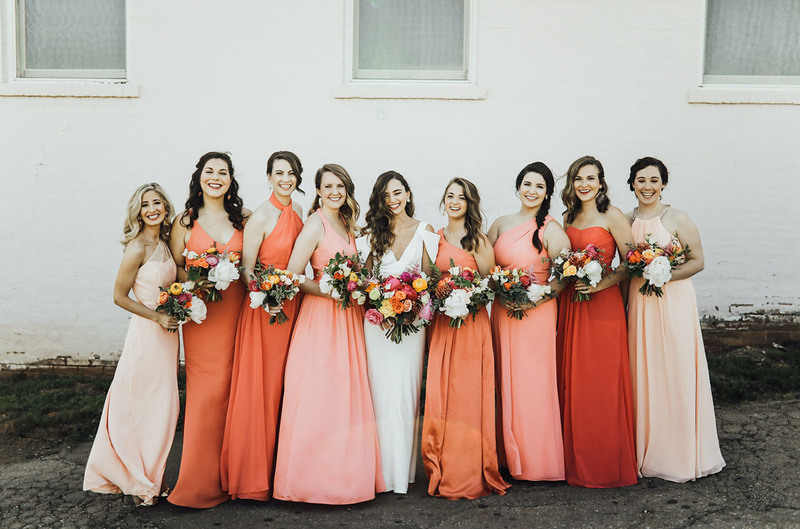 The bridesmaids rocked shades of orange from Vera Wang for David’s Bridal and we’ve got to say — orange makes for quite the fun picture!! 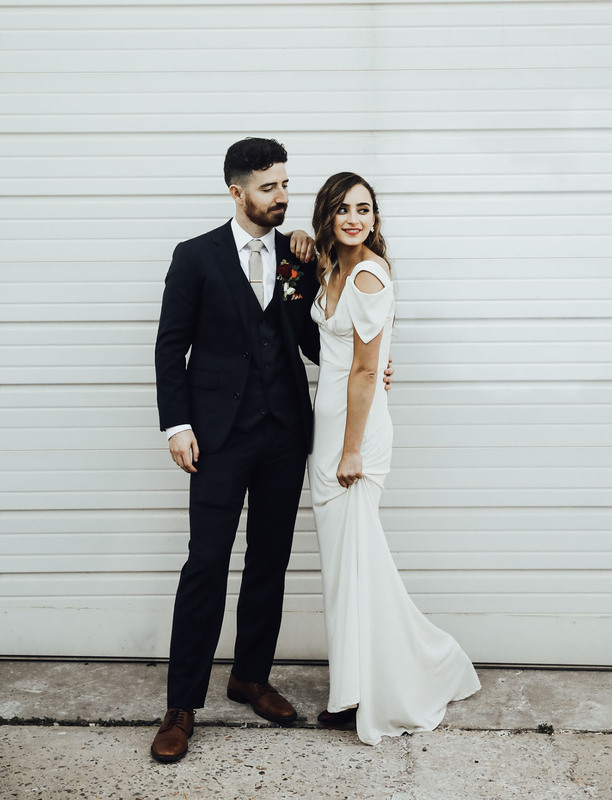 Want to steal their look? 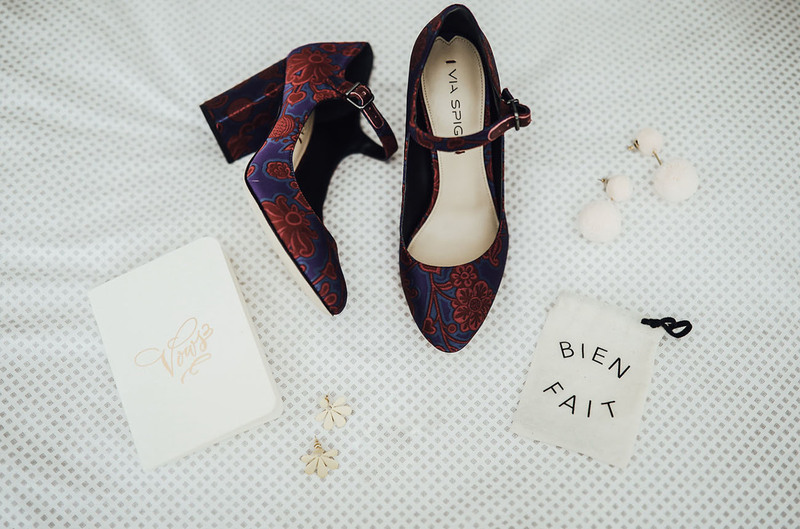 We’ve picked out a few of our faves below. 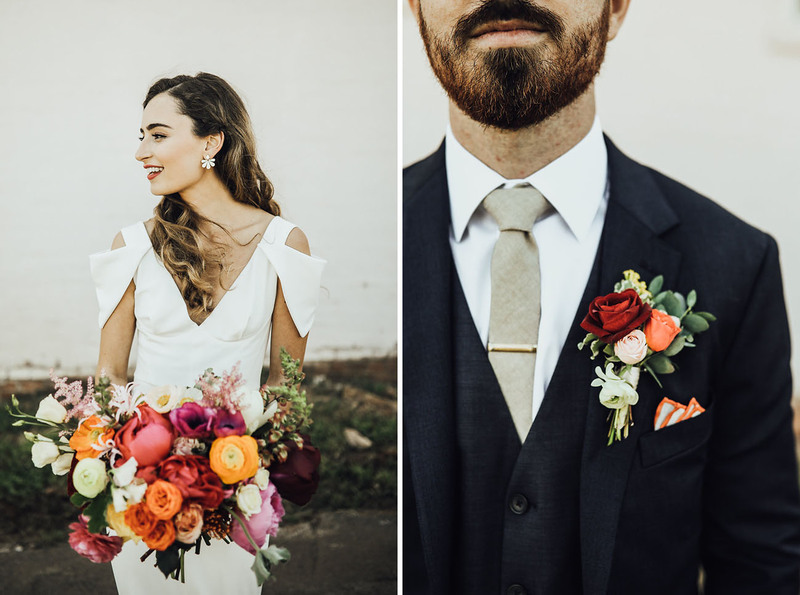 THOSE FLORALS!! Can we have those displayed in our house everyday? 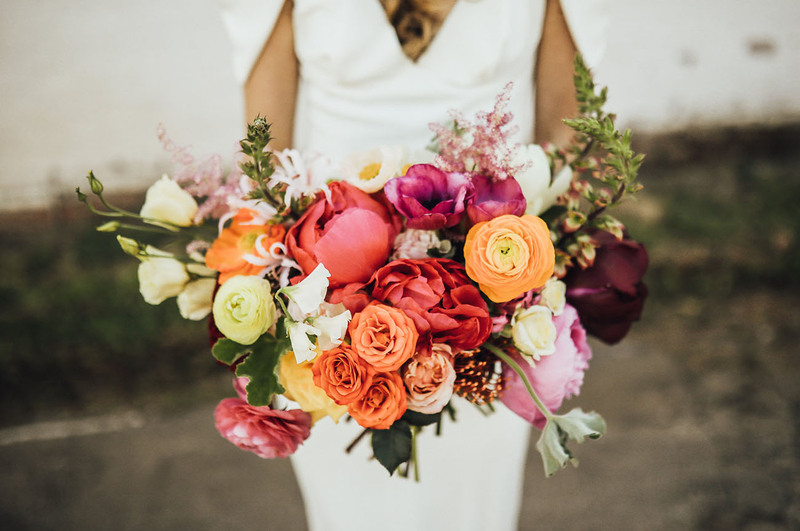 Such a cheery collection of colors + textures by Juniper Designs. 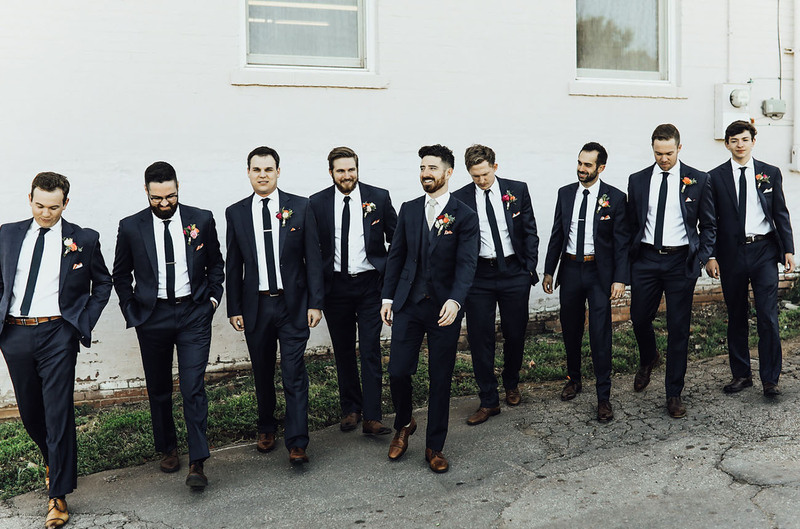 The groom + groomsmen looked sharp in their suits from Bonobos. 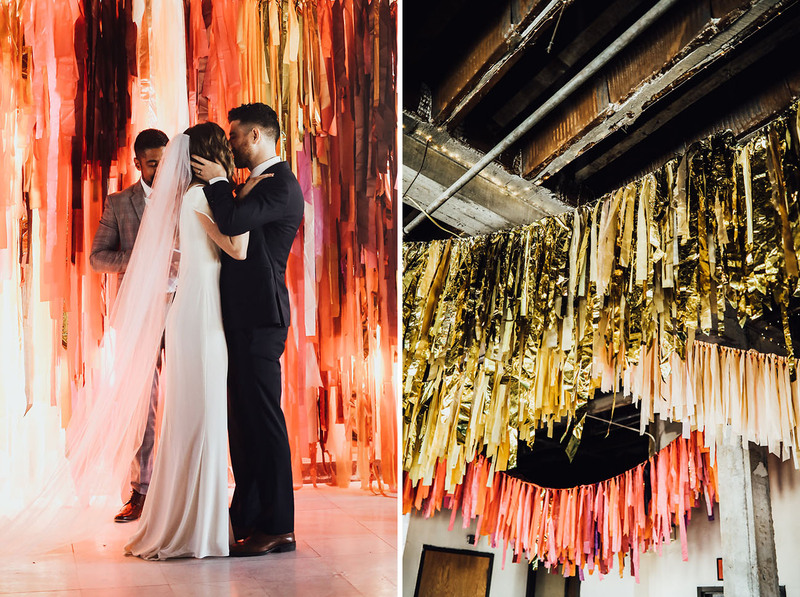 And the award for *most epic* backdrop of all time goes to The Color Condition! 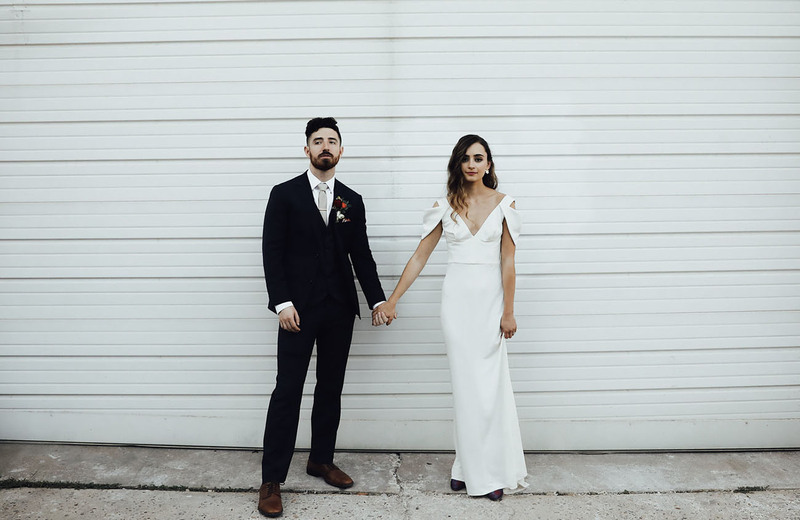 We wrote our own vows and didn't show them to each other before the ceremony. One of my favorite parts of the day was finally sharing those words and promises with Caleb and him sharing his promises with me. 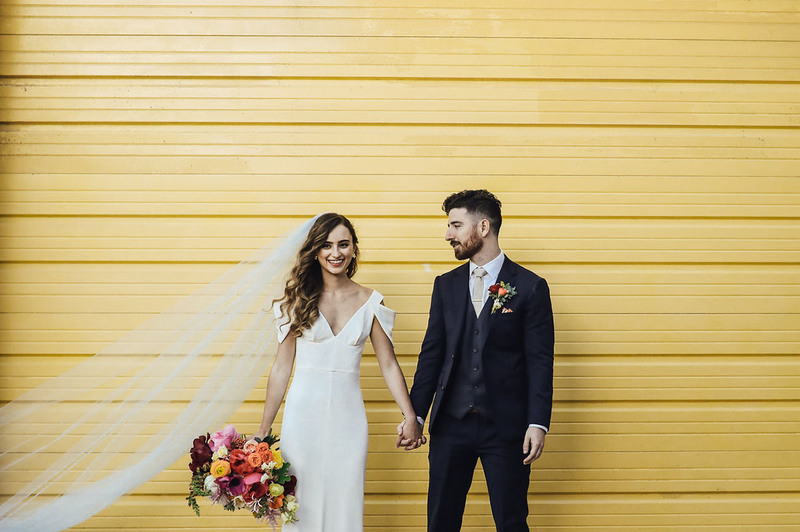 We *TOTALLY* get what Victoria + Caleb meant when they said they wanted to capture the feeling of an old photo… Like a faded Polaroid with golden tones of halcyon days. As for that stunner of a dress? It’s by Allen Schwartz from JJ Kelly. 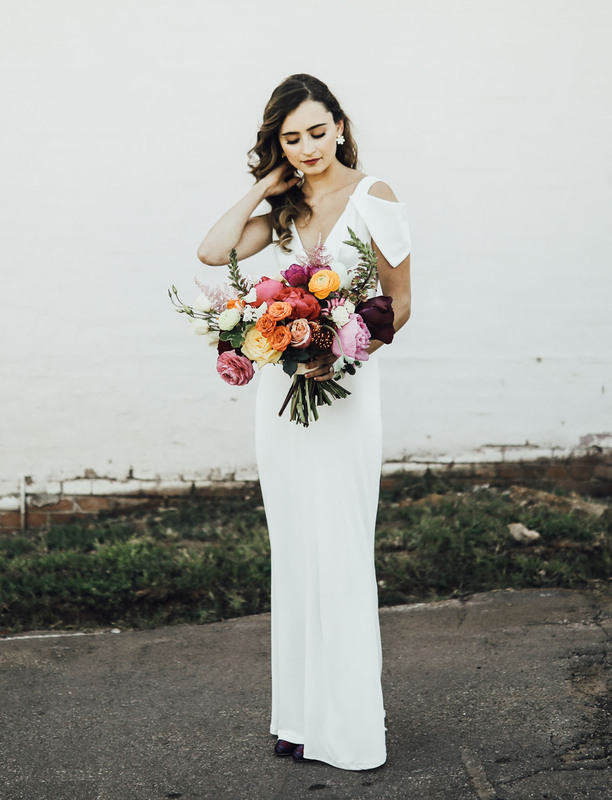 Modern, yet vintage-inspired, and totally classic. 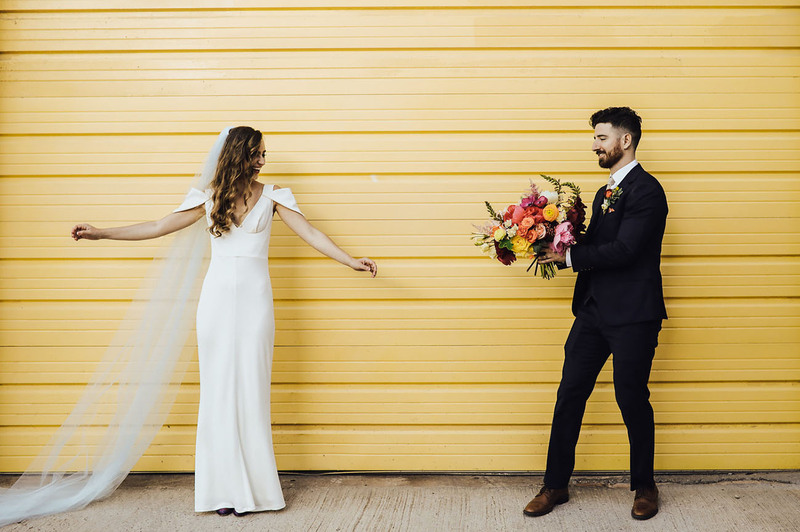 Capitalizing on the color, how gorgeous are these bride + groom portraits in front of the yellow wall?! 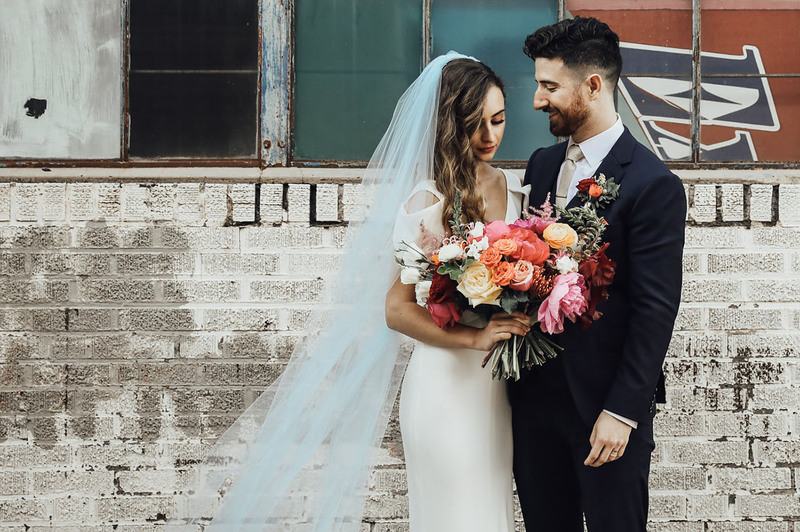 Absolutely LOVIN’ the way it complements Victoria’s bouquet!! 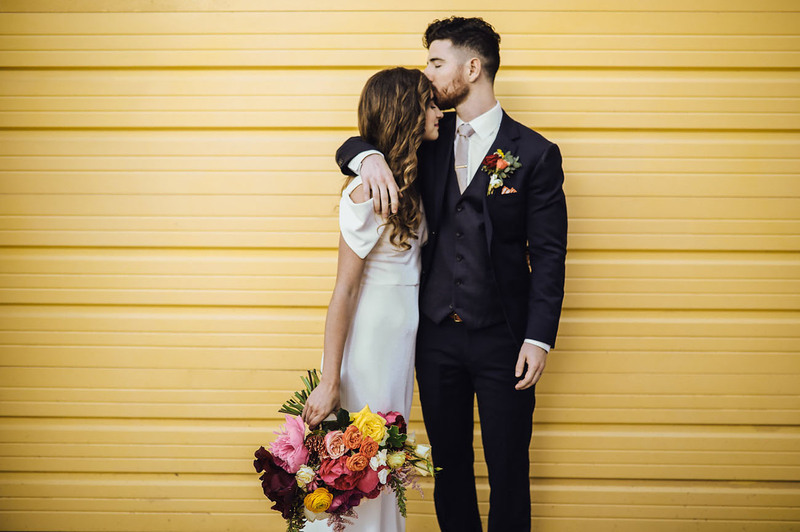 Your wedding is the one chance you have to get all your favorite people in a room and share your favorite things with them. 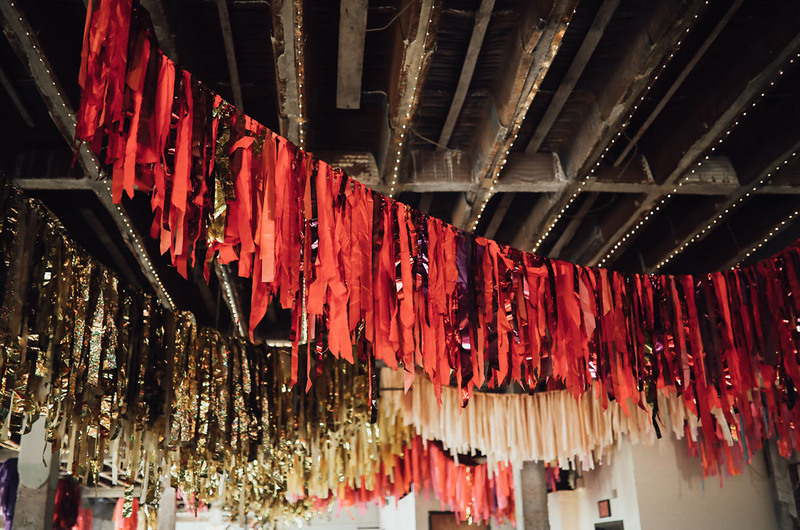 You get to tell your story with music, traditions, atmosphere, and color. Remembering that helped us create a day that felt like us. 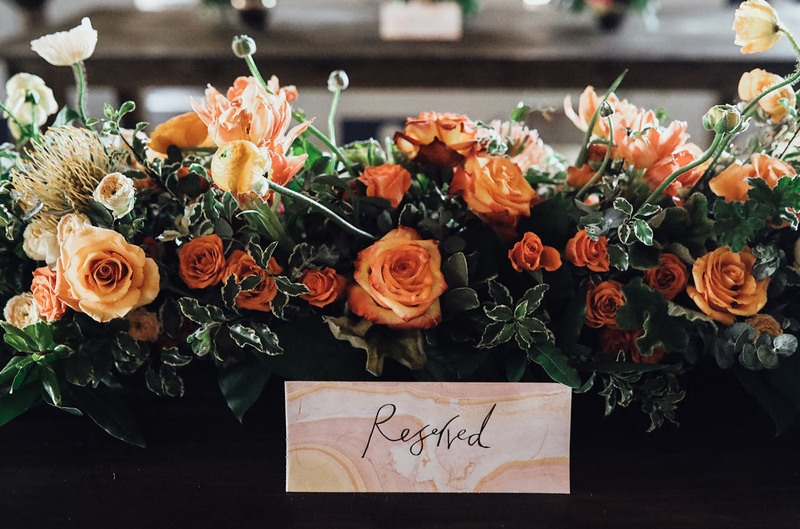 Don't assume you have to do anything a specific way just because it's a wedding, and don't doubt your personal taste. You get to choose how this day goes! A few weeks before the wedding, someone (I don't even remember who!) told me that everyone would be watching me all day and all weekend long. 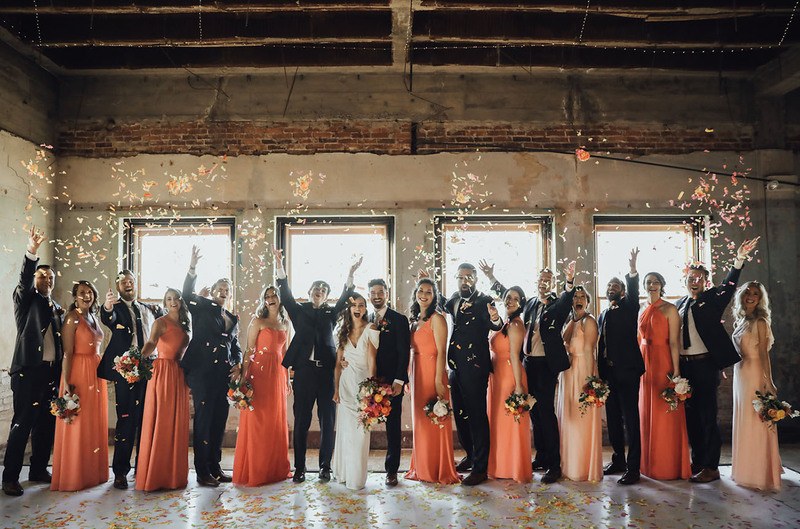 As the bride and groom, you set the atmosphere for your wedding party and family, and ultimately the whole event. If you are calm and having fun, they'll be able to do the same, but if you are tense and anxious, everyone will magnify that back to you. 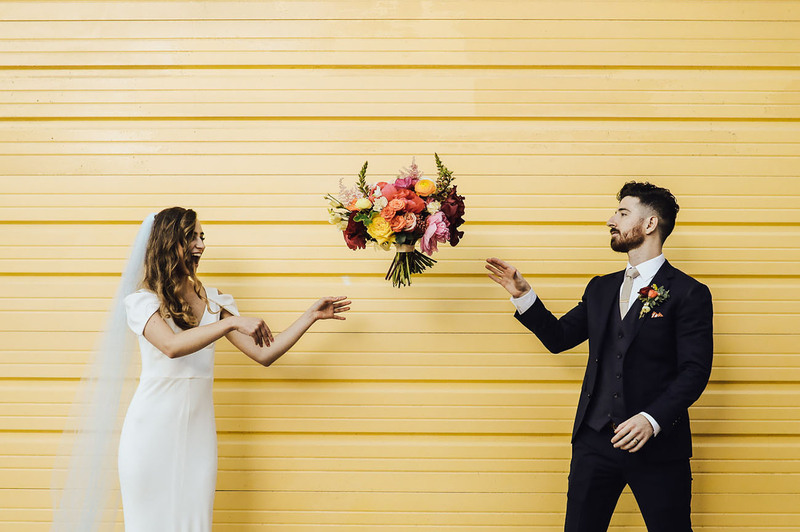 Whatever it takes, try to relax and enjoy your wedding day! 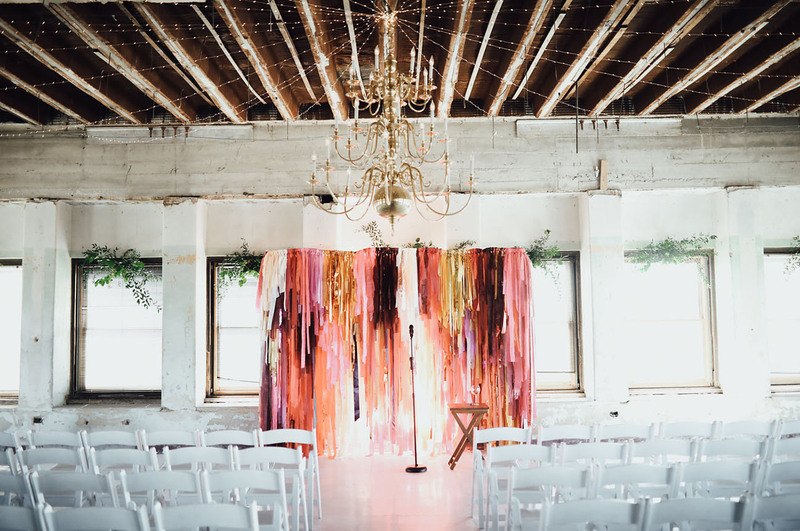 For a wedding, bridal shower, brunch party, or any kind of event — aren’t the colorful steamer chandeliers by The Color Condition fun?! If you can’t decide on what flavor of cake or settle on a dessert… Why not have them all?! 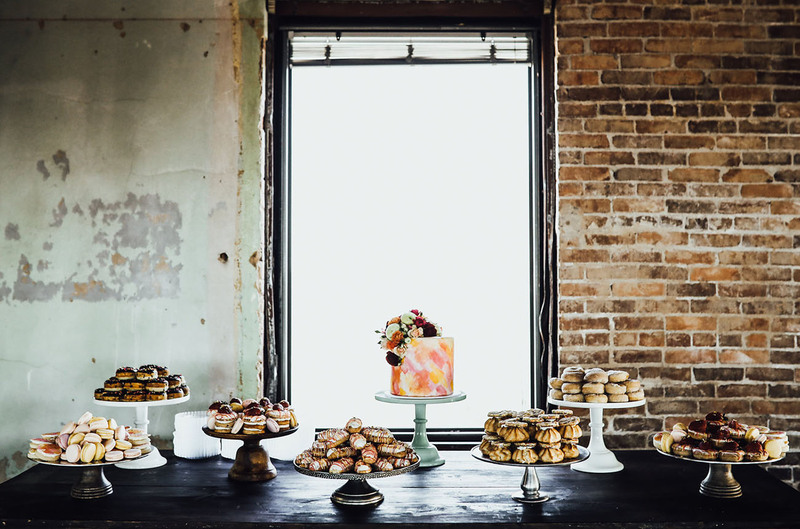 We’d gladly dive into this spread of saccharine sweets from Brown Egg Bakery. 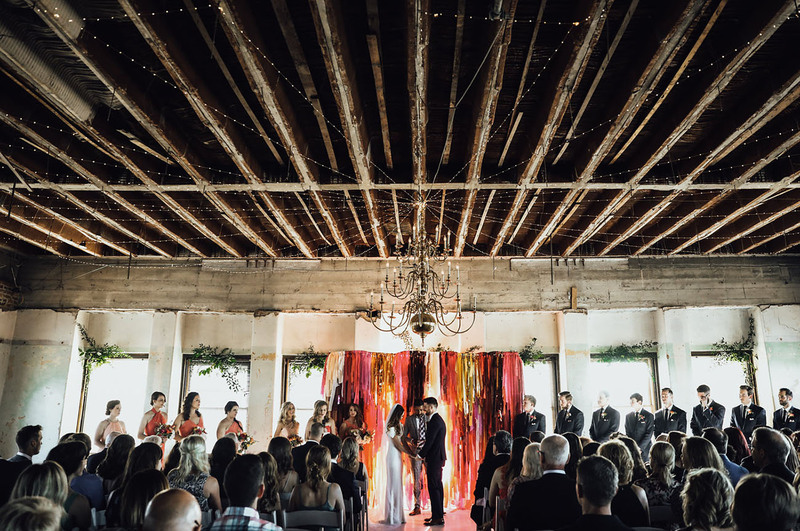 The Ceremony location looked perfect. Such warm and inviting colours, looks rich and vibrant. Congratulations! Love all the vibrant colors! 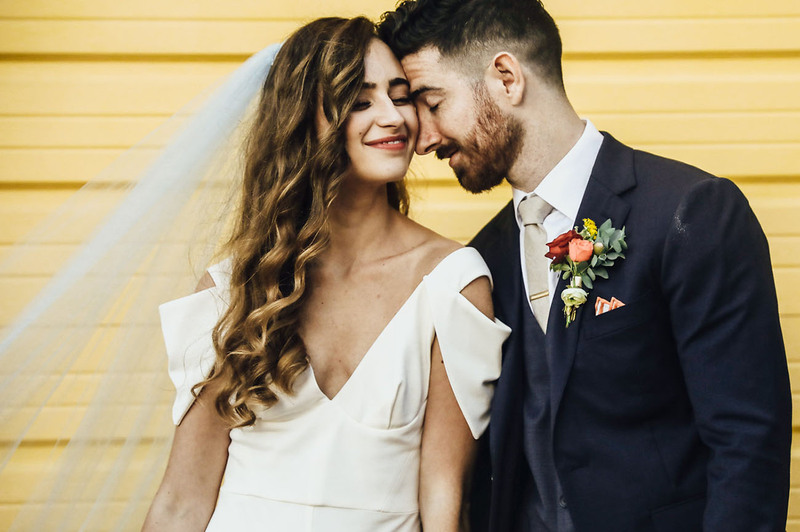 Gorgeous couple, gorgeous wedding !